CityGrips Double bar fit umbrella / buggy strollers. Keep your stroller cleaner, healthier & more beautiful for You & Your Baby. Protect grips from wear & tear. Machine was and dry dirt and germs away. 2 per pack. CityGrips not only provide a cleaner, more germ-free stroller, they’re also cushiony soft…so much more comfortable then the sweaty factory rubber or foam grips most stroller come with. A. CityGrips double bar fit over almost 90% of strollers. Click here to get a full list of strollers it will fit. The best thing ever! Love the way my stroller feels….. I don’t think i’ll ever be able to stroll without these. 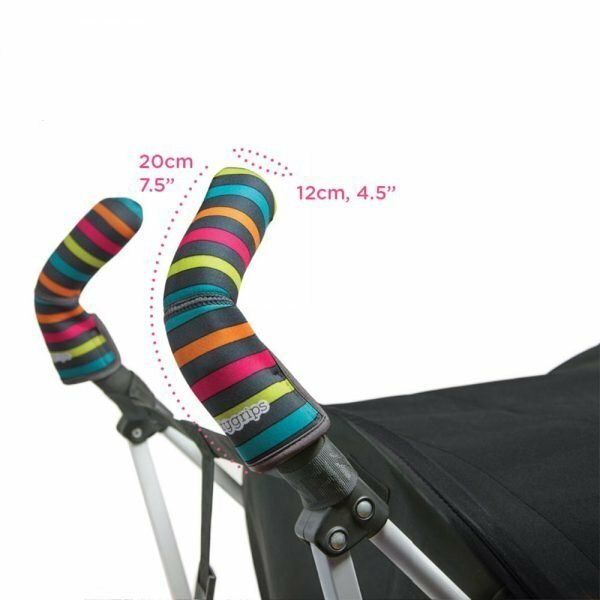 I purchased these grips to protect the handle bar on our Baby Jogger City Select with Second Seat, Onyx and have been extremely happy with them. Not only do they protect the handle bar, they also offer a little cushion that makes the stroller more comfortable to push. I also really appreciate that the grips don’t take up the entire handle bar, so I still have room to hang stroller hooks and an organizer (as seen in pictures, we use the Dot&Dot – Baby Stroller Attachable Organizer – Diaper and Bottle Tote Bag – Specially Designed Bag to Attach To Strollers, Walkers and Car Seats to Lighten Your Load While Out and About With Your Baby and all pieces fit well together) Overall I find these grips to be a great value. They make one of the dirtiest parts of the stroller easier to clean and are a very cheap way to protect expensive strollers from wear and tear. This made strolling more comfortable. Brilliant idea. This is just a fantastic purchase I have ever made. It sets your stroller apart form everyone else. I love this product. My absolute favorite stroller accessory is the citygrips bar covers… A total must have. Unfortunately, our stroller has been damaged so bad while on trips here in the U.S. and abroad by the airlines, but these grip covers made our stroller look new again. Just a tip – take them off before checking your stroller at the gate. I had to buy another pair as they slipped off when they checked it in for me. These are an excellent option to install over sticky grips and also come in may colors. I will be buying another set for the other stroller. I highly recommend these. My new BMW Maclaren stroller has light grgey gel handles which are absolutely not practical and gets dirty each time you touch it. These grips not only fit perfect and look stylish but also feel soft and comfy to touch! I actually did not expect it will be this good. i would recomend it to anybody even if the handles are black, being a nurse i would suggest this as an infection control as well due to it is easy washable. Thanks for an amazing product! The fit is perfect for our maclaren twin techno and they are very comfy on the grip. Highly recommend. They arrived pretty fast even though we dont live within the US. I bought them wondering if this would be the solution for the handles of my first childstroller. As our second is coming, I wanted to use the same stroller, but the foam prom the handles was kind of dry, broken. It was solved wit this grips! Why aren’t these available more places? Makes so much sense and love the super cute design! Give these to all my friends w a stroller to keep their handlebars clean! They worked great. Our handles were starting to rip but the stroller was in great shape. These fit great and feel great. They stay on nicely as well. Used on my orbit after the handle bars got gooky and nasty. Really helped a lot!!! I could’ve just bought new handles but my guess is that they would’ve done the same thing over time. The city crips fit on most strollers and I can wash them!!!!!! Love them! I have a Joovy stroller with hard molded handles that were very uncomfortable on the hands in short order. I saw a link to these in a review and am so glad I did. These grips have made it MUCH more comfortable to use the stroller, and they stay in place on it very nicely. They also adapted pretty well to the peculiar shape of the stroller handles.